My girlfriend and I are going to spend a few days in the Pigeon Forge/Sevierville/Gatlinburg area of Tennessee later this year. The fastest route seems from my area seems to be via US 460 and I-81, with the I-85 to I-40 route through North Carolina being nominally slower. I am familiar with the traffic on 85 and 40 between Durham and Greensboro, but my only experience with I-81 has been north of where I’ll be, and as I understand 81 is frequently clogged with trucks. I’d be leaving on a Thursday morning, and would likely be hitting Durham around the morning commute if I took 85-40. I am also aware that the construction I encountered on 85 in January will most likely still be ongoing. The Goog gives me a route around Roanoke (SR 652 from US 221/460 near Blue Ridge to US 11 near Troutdale), however Street View shows a sign that says this route is not advisable. Anyone have experience with this road? I’m fine with a twisty back road (we are, after all, going to be staying in the mountains) but if it won’t save any time over going through Roanoke and Salem (or 220A, or even Durham and Greensboro) I’ll skip it. Also, anything noteworthy in the area we’ll be staying, or on any of the potential routes in between (preferably not far off the interstate)? The Tail of the Dragon isn’t that far away, but we probably won’t get there. The unfinished Foothill Parkway is nearby. 85 to 40 takes you south of Pigeon Forge, and you have to go north on I-40 once you pass Asheville. That's a neat drive, though, and the drive along US 321 from the Cosby area to Gatlinburg is scenic as well. I actually like the drive from the Roanoke area southwest on I-81, and the addition of the third lane just prior to Christiansburg is a blessing where the trucks are concerned. I'm thinking your best bet is taking 460 to 220A over to 81. You could always go one way there and the other way on the way home, but on balance, I'd probably pick 460 to 81. I-40 across North Carolina from Greensboro to east of Asheville before you climb the mountain is, to me, boring. The cutouts are all gone from Abingdon and Bristol, but you can check out State Street in Bristol with the metal markers in the street's center line denoting the state line. There may be some cutouts left in downtown Christiansburg. It's been a few years since I've been there, though, so I'm not sure. You have a number of options to get from the interstate to Pigeon Forge. TN 66 at Exit 407 is the major-route, but it's usually busy. Using I-40 or US 25E to US 321 is more scenic. There used to be a neat old truss bridge on 25E between Newport and Morristown, but it may have been replaced by now. There was also a circular flashing strobe red light on US 70 east/US 25W south approaching US 25/US 25E at Newport. There's also the wrong-way concurrency of US 411 and US 441 west of Sevierville. The Parkway (the road between Gatlinburg and Sevierville) is neat, with a tunnel involved. You may also want to drive up to Newfound Gap. Only 1 cutout left in Christiansburg AFAIK (US 460 Business sans banner WB just before College St). Although I-40 through the Piedmont of NC is not very exciting, it does give the option of going through GSMNP via Cherokee, NC to reach Sevierville. Thanks guys. I’ll try and work in what I can. We’re staying in Sevierville. If I take 40 the eastern segment would fit into the route there, via TN 339 west of Cosby to US 411. I am indeed thinking about doing 460/81 on the way there and 40 on the way back. The best of both worlds. If I take 81 all the way over to 40, it looks like doubling back to 321 or even 411 would cancel out any time savings over 66. However, I may bail off of 81 at 25E given your next paragraph. The bridge is marked on Google Maps as the Walters Bridge, but it looks like a new bridge has been built as the Street View from it is a couple years old and shows the new bridge being constructed. I may head that way to check it out. Is this the red signal? The wrong-way concurrency will be an easy one to check out. A drive in the mountains is very likely, so I may work that in. I’ve been to the area once, sometime in the mid 90s (1994 IIRC) and we actually took the route through the park to get there. I distinctly remember the little loop on 441. Found my pictures of the circular strobe red light. On the return trip I’m now strongly considering clinching the newly truncated US 311 all in one shot before it inevitably becomes an extended US 360. Oh, any particular speed traps on 81? One could argue "all of it". My general philosophy: where the truck traffic allows you to do so, keep it around 75. The section between US 220 and VA 112 when free flowing is very easy to get well above the reduced speed limit through there (60 mph). The Parkway can be tame (TN 66/US 441) can be tame, depending on when you're traveling on it. I've witnessed Sunday mornings as a big no-no, but haven't been that way since they finished expanding to six total lanes during that timeframe to give you an accurate feel. The DDI does feel like it helps get traffic through a bit better, though. Get to Gatlinburg as early in the day as you can. Traffic and parking get worse as the day progresses (like everywhere else), but it's bad on that main drag heading into the park. If you're coming into Gatlinburg from the park, it's possible to take a bypass around Gatlinburg, but you still might have fun once you get towards Pigeon Forge. Veterans Blvd kind/sort of parallels the Parkway, and goes by Dollywood. 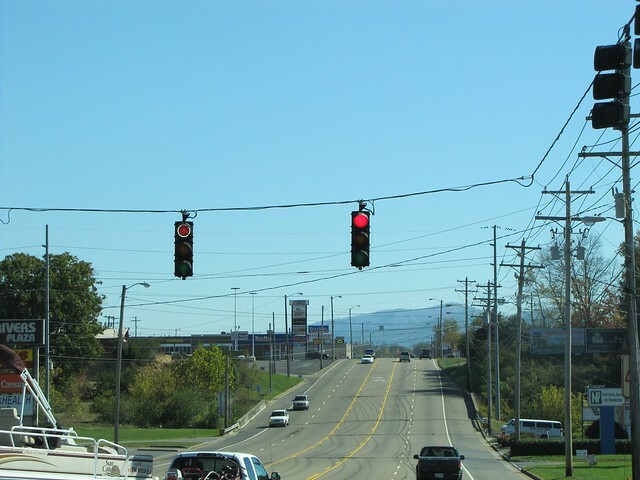 It also ends on the east side of Sevierville, at 411. If you wanted to take 321 to Cosby/Gatlinburg via 81, you could also hit either TN 93 (Exit 50), TN 172 (Exit 36), or TN 70 (Exit 30) and pick up 321 in Greeneville. Each route is two-lane. 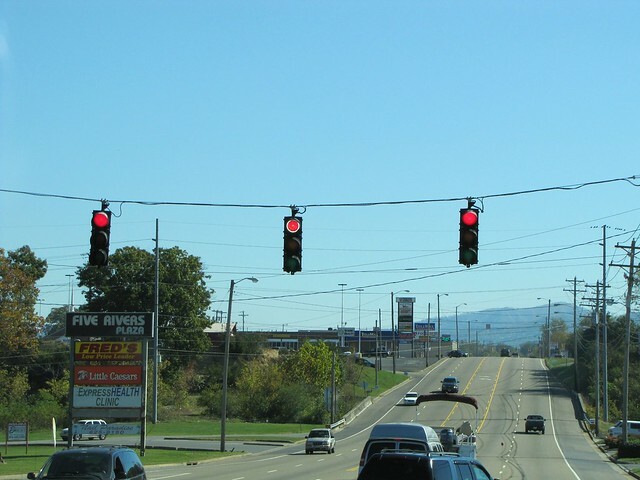 Leaving Greeneville, you start off two-lane, but switch to four-lane a little bit outside of town. The aforementioned 25E is another option, to Newport. Both of these feel slow to me, but depending on traffic on the Parkway, may be a bargain. You'll need to pick up 25W to go past 40 to get to 411, if you want that route. You can also avoid some of the Parkway via Douglas Dam Rd to Deep Springs Rd (Exit 412) heading back on 40. My future wife and I started going to that area long before the era of GPS navigation, smartphones, and even computer mapping software. The Web was in its infancy. I actually found a way to order, and did, a TDOT-issued map of Sevier County to find routes around the congestion on 441. We always stayed in Gatlinburg but frequently went to attractions in Pigeon Forge or Sevierville. If our destination was somewhere beyond the commercial area, we'd turn near the Old Mill and take a back road that was shown on that map. Eventually, TDOT made one of those roads into a state route and made some improvements on the back side of Dollywood. Note that we have not been back to that area since 2000, and I'm sure there's wall-to-wall development everywhere, so I probably wouldn't recognize anything. I drove through Sevierville on 411 year before last while clinching it, and even then I noticed little that I really remembered. How well has the area recovered from the wildfires of a couple of years ago? IIRC, the tunnel on US 321/421 between G'burg & PF is used for the north bound lanes only. Southbound goes around the edge of this mountain. My wife & I went there exactly 2 years ago this weekend for our first wedding anniversary. Driving on the GSMNP is beautiful, but can be filled with traffic. We went early one morning and came up on several stopped cars. We looked over in this clearing and saw several elk grazing. We stopped & observed them with everyone else. That was so cool! Beware of bad weather on that road. A small tree fell across the road blocking both lanes when we went. Traffic backed up for miles. The NP people were nowhere to be found, and cell phone service does not exist. Many of us got out, in a pouring down rain, and moved the tree ourselves...using someone's pick up truck & thick nylon strap to drag it. Also, if you have time & money, take a ride on the Great Smoky Mountain RR south of GSM NP in Bryson City, NC. In 2016, 2 first class tickets were $222. Beautiful ride. They may even have their steam engine running again by now. Regarding speeding on I-81, a fellow I know got a ticket for going in the mid-70s in the 60-mph zone near Roanoke a few years ago, so I'd be cautious of assuming you're OK below 80 mph. I am familiar with the traffic on 85 and 40 between Durham and Greensboro, but my only experience with I-81 has been north of where I’ll be, and as I understand 81 is frequently clogged with trucks. This is pretty much true, though I don't think it'll be that bad on a Thursday afternoon (it's usually the worst on weekends). Traffic does clear out slightly as you pass the southern I-64 and I-77 exits as traffic splits off to other destinations. The 60mph limit around Roanoke is somewhat of a joke (I've not seen anyone pulled over there in a few years), but I would definitely watch out for increased enforcement along I-81. The Goog gives me a route around Roanoke (SR 652 from US 221/460 near Blue Ridge to US 11 near Troutdale), however Street View shows a sign that says this route is not advisable. Anyone have experience with this road? I’m fine with a twisty back road (we are, after all, going to be staying in the mountains) but if it won’t save any time over going through Roanoke and Salem (or 220A, or even Durham and Greensboro) I’ll skip it. From what I recall, it's a somewhat standard VA rural route with center striping but zero shoulder and no edge-lines. Fairly twisty, so a no-go for trucks, but should be an manageable journey (though a bit steep) for most passenger vehicles. However, I doubt it'll save you much time unless there's fairly bad traffic on 460/220A. Relationship’s over so this won’t be happening. Thanks for all your suggestions though.